The research group of Francine Marleau is interested in galaxy formation and evolution. The properties of galaxies at different cosmic times and in various environments are studied in order to obtain a complete picture of how galaxies assemble and evolve. These include, for example, the star formation and black hole accretion activities which can then be used to understand the role of central massive black holes in galaxy formation and evolution. The group uses imaging and spectroscopic observations over a wide range of wavelengths (from radio to X-rays) taken with state-of-the-art ground- and space-based facilities (e.g., ESO-VLT, JCMT, Gemini, CFHT, Spitzer, HST, Planck). Francine Marleau is a member of the Euclid Working Group on Galaxy & AGN Evolution. She is also a member of the MATLAS (Mass Assembly of early-Type GaLAxies with their fine Structures) international collaboration which investigates the mass assembly of early-type galaxies and the build-up of their scaling relations with extremely deep optical images. She leads the project on dwarf galaxies in low density environments. The group has recently been awarded time on the VLT for the spatially resolved study of ultra diffuse galaxies using the Multi Unit Spectroscopic Explorer (MUSE). 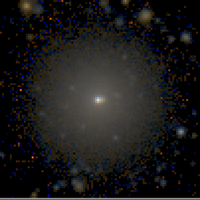 Optical color image of an MATLAS nucleated dwarf galaxy (Habas et al. 2019). 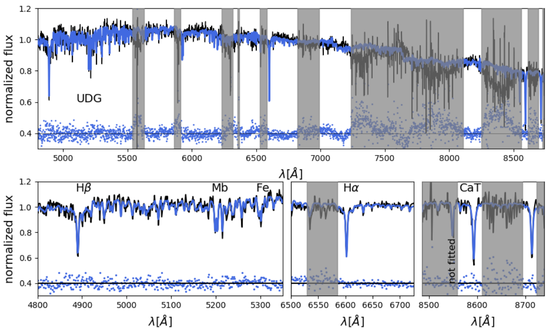 VLT-MUSE spectrum of the UDG NGC 1052-DF2 (Emsellem et al. 2018, Fensch et al. 2018).